Home > Blog>Category 1>People ask us: "My ham has white dots, is it good to consume?" People ask us: "My ham has white dots, is it good to consume?" Today we want to tell you more about the famous little dots or white crystals may appear in Iberian hams. Every year, our customers ask us what are those white dots in their ham and if the piece is suitable for consumption. We are here to clarify it. What are the white spots in the ham? Those white dots that appear in the ham are crystallizations of tyrosine amino acid. Formation of these crystals takes place during the Iberian hams maturation process. Tyrosine amino acid may be found in the structure of most proteins in mammals’ organism. Amino acids may be classified as essential, which are produced thanks to a good diet, and non-essential amino acids, which are produced thanks to our own organism. Specifically, this amino acid is classified as non-essential because its structure is given by phenylalanine hydroxylation, component of some proteins. Why those white spots do appear in hams? These tyrosine crystallizations occur when the proteins in the ham are degraded, so concentration of free amino acids increases. Reaction of those amino acids occurs due to low solubility of tyrosine. 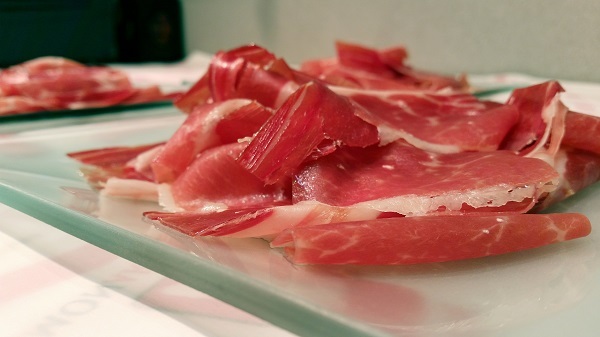 When hams lose water, tyrosine is regrouped and forms the famous white crystals of Iberian hams. Although this reaction has its origin in proteins and their composition, it is also given by some external factors. The feed that the pig follows is fundamental. Basically, this is a sign that the pig has been properly fed and has followed a healthy and balanced diet. Is the ham good if it has those little white dots? Indeed, the ham is good to consume when it has these white dots. It is common to think these white dots may be a sign that something happens to the piece, but the reality is totally opposite. These crystals are a symbol of high quality hams and the process of curing has been correctly done: with care, time and dedication. In conclusion, the appearance of those crystals in hams is not a cause for concern. Actually, its appearance is a sign that healing and maturing processes have been carried out slowly and with care. It is an exquisite piece! Do I remove the fat in the Iberian ham or should I eat it?